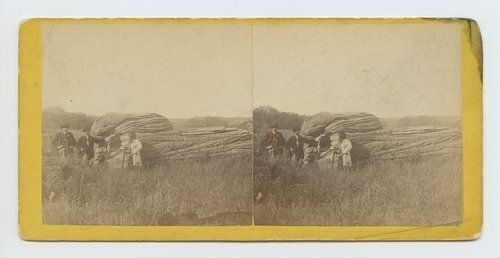 This stereograph shows Devils Bake Oven, a rock formation, on Alum Creek, Kansas. There are people standing next to the rock. It is from Alexander Gardner's series, Across the Continent on the Union Pacific Railway, Eastern Division. Devils Bake Oven on Alum Creek, Kansas. 7 Miles east of Fort Harker & 496 miles west of St. Louis Mo.